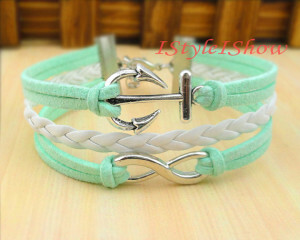 (an Etsy store) and show you a couple bracelets I ordered from there . I am so excited to get these! I’m constantly on the lookout for unique looks at a reasonable cost, and, if I can support Etsy shops and other small businesses, all the better! There is also great Christmas gift potential from the shop if you have anyone that loves unique charms and chunky bracelets. I am going to have to be patient because they are coming from China but that doesn’t mean I can’t show you sneak peaks from the shop! 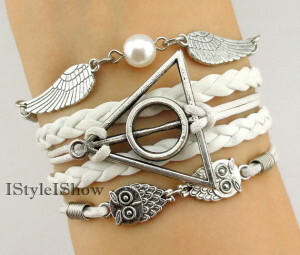 First, I ordered this Harry Potter themed bracelet. I just couldn’t resist! I love nerdy things that aren’t entirely noticeable as such unless you are also nerdy. Plus, this will be perfect to wear when we pop over to Harry Potter world for a day in October during the big family trip to Disney world. 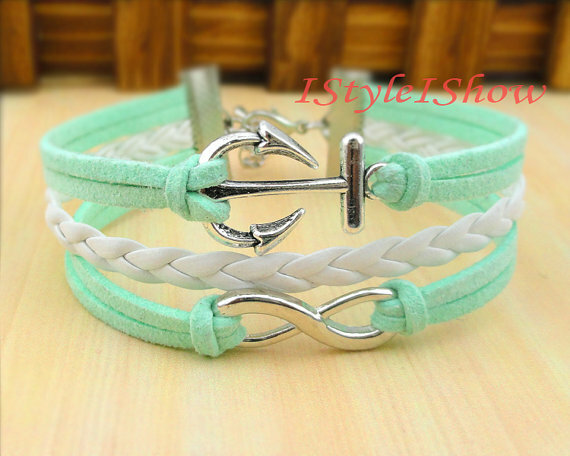 Then, I really liked the white and aqua on this bracelet – plus the romantic sentiments. Do you have any recommendations of shops I should check out? Do you own your own shop? Love Harry Potter! That bracelet is subtle and nerdy at the same time.